Using essential oils can be great for your mental and ﻿﻿physical ﻿﻿health. When oils are diffused in the air, they can offer stronger benefits than they would normally. While some people put their oils into a humidifier, it’s better to use the best essential oil diffuser. I want to help you learn how to find a good diffuser to meet your needs. A nebulizer diffuser works in the same way as a perfume sprayer by doing something called atomizing. You will hook the diffuser up to the bott﻿﻿l﻿﻿e of oils directly, and a jet of air will blow over the top to draw out the oils. This breaks up the whole oil into tiny droplets and sprays it into the air. No water is mixed in with the oils as they’re spraying out, making the concentration higher. Nebulizers spray oils very quickly into the air, so they’re good for making a high concentration of oil as fast as possible. However, they also use a lot of oil compared to others, so you might end up having to buy more oils when you use a nebulizer. Diffusers that use ultrasonic technology are similar to humidifiers, except that they give off a cool mist instead of hot steam. You pour a few drops of oil into the reservoir and mix it with water. Then, a rapidly vibrating plate will break up the oils and water into microparticles. These particles will disperse into the air and create a water vapor with a small concentration of essential oils. There won’t be as much in the air as there would be from a nebulizer, but it is still a good concentration to get some of the benefits from the oils. 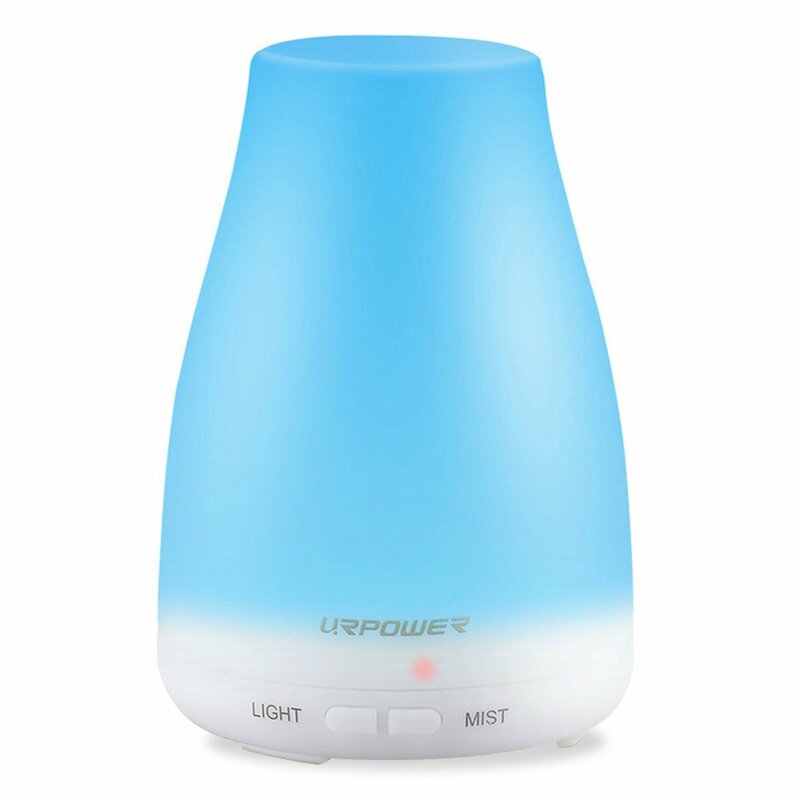 Ultrasonic diffusers work well in the winter, since the humidifying benefits keep your airways moist in the dry weather. While this is usually considered the worst form of diffuser for aromatherapy benefits, it’s perfect for getting the scent into the air. Some use high heat to get the oils into the air quickly, but the best heat diffusers use low, consistent heat to evaporate oils and water into the air. One of the benefits of a heat diffuser is that this method of use is completely silent. It also works very quickly to get the scent of the oil out into a room. However, because the heat breaks the oils into different components before dispersing them into the air, you won’t get all the benefits from each oil. Instead of using heat to evaporate the oils, an evaporative diffuser sends air through a tube and into sponge or filter with essential oils. This breaks up the oils into tiny particles and disperses them into the air. No water is needed, so the setup is very simple. Similar to heat diffusers, these diffusers don’t provide the best aromatherapy benefits. The reason for this is the oil particles are broken into smaller pieces and diffused unevenly. For the first 30 minutes or so of diffusion, the small particles will be diffused into the air. It takes longer for the larger particles to be diffused, so you won’t get the full benefits of whole oil diffusion. Also, these machines can be a bit louder than some other types, since they must use constant air flow to work. Essential oils are known to have a lot of therapeutic benefits when they are diffused in the air. Aromatherapy is practiced around the world for mental and physical health. Its benefits are numerous, and you may find that a condition you’ve been dealing with can be treated with the right aromatherapy routine. Essential oils put a fantastic scent into the air. When you diffuse the oils, you’ll be spreading the scent of the specific oil as an air freshener around the space the diffuser is in. What a great way to make your house feel welcoming to guests, or to create the right mood on a dreary day! It’s hard to list all of the benefits of a diffuser, since that partially depends on the type of essential oils you are using. Each one has its own benefits, and they can help with anything from stress to ﻿﻿﻿sleep or headaches. Choose whichever oil suits you best, and a diffuser will help you to get the best out of it for your improved health. I went into detail about the types above, but the basic types you’ll find are the nebulizers, ultrasonic, heat, and evaporative diffusers. The most common by far is the ultrasonic, since it’s a good mix of aromatherapy and humidification at a reasonable price. Nebulizers are fantastic for aromatherapy, but they’re usually significantly higher cost. It’s convenient to have a machine that will shut off after a certain period of use, so that it doesn’t get ruined or waste oil. Automatic shutoff is great for using the diffuser at night for sleep as well, because it will turn off after helping you fall asleep. When you’re dealing with any type of diffuser, you’ll want to know how much oil or water it can hold at once. 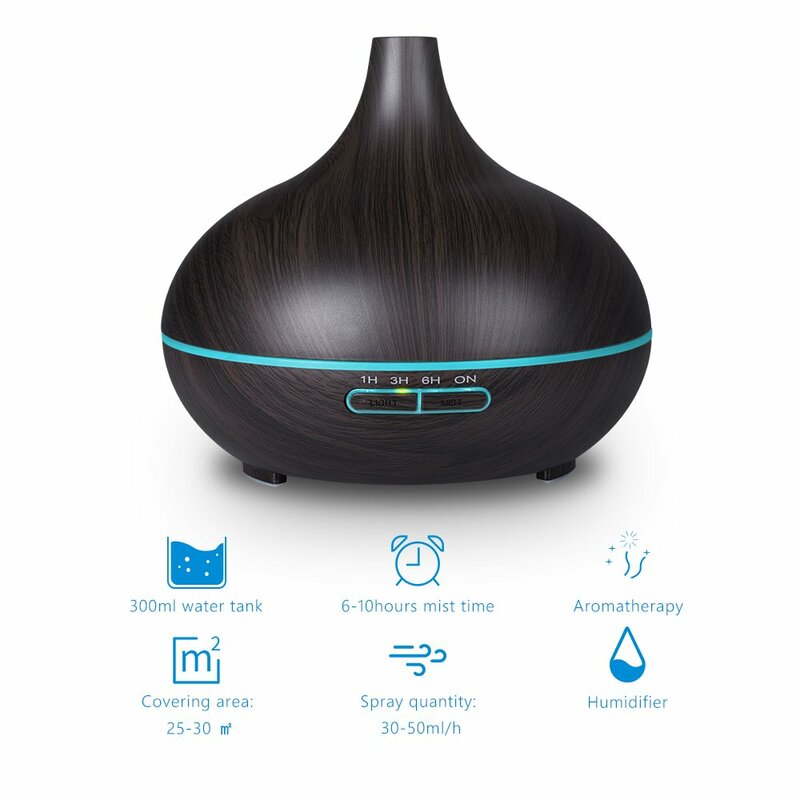 Ultrasonic diffusers mix the oils and water together, so the capacity is especially useful knowledge on these devices. Many diffusers now come with LED lights that will turn on to form a pleasant glow around the diffuser. Some will change colors to create a relaxing mood. Combined with aromatherapy, the lights create a nice mood for you to fully enjoy your essential oils. This ultrasonic diffuser is a great addition to your room at night or any other smaller space around the house. It has a lower capacity than some other home units, making it great for helping you fall asleep or giving you a daily burst of something nice around the house. ​Built-in LEDs can cycle between 7 different calming colors or you can choose to keep the light on your favorite color all the time. Let the mist come out continuously or set it to intermittent operation and let the diffuser run for up to 6 hours at a time on a full load of water. 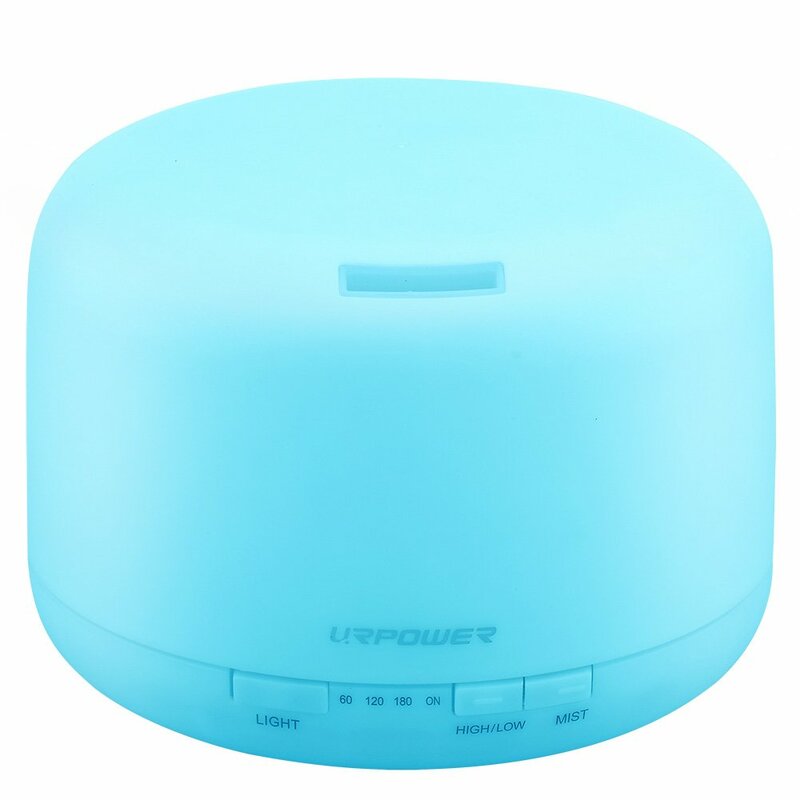 ​This is a unique looking diffuser to start with, because the entire body is a pleasant blue color. It’s a good night light, because of the built-in LEDs, but it also works really well as a night-time diffuser to help you get some great sleep. With up to 500ml of water and oil mixture to use, you can run this diffuser for up to 10 hours on the lowest mist setting. ​There are a few settings you can adjust for a better experience. When you turn it on, you can have it shut off automatically at after 1, 2, or 3 hours. Otherwise, it will stay on until the water runs out. Light can be cycled between a few different colors, or you can stick to the color of your choice. If you don’t want any light at all, simply switch it off and use the diffuser alone. ​Sporting a beautiful wood grain style exterior, this is an attractive set piece for any room in the house. It works well without looking foreign or out of place in your home. It can hold up to 300ml of water, and you can set it to work continuously until the water is empty, or set it to go off after 1, 3, or 6 hours. ​There is a small band of light that can be seen around the device. This is an LED light strip that changes between 7 different soothing colors. You can also turn off the light completely or have to stay on your favorite color, if you prefer. 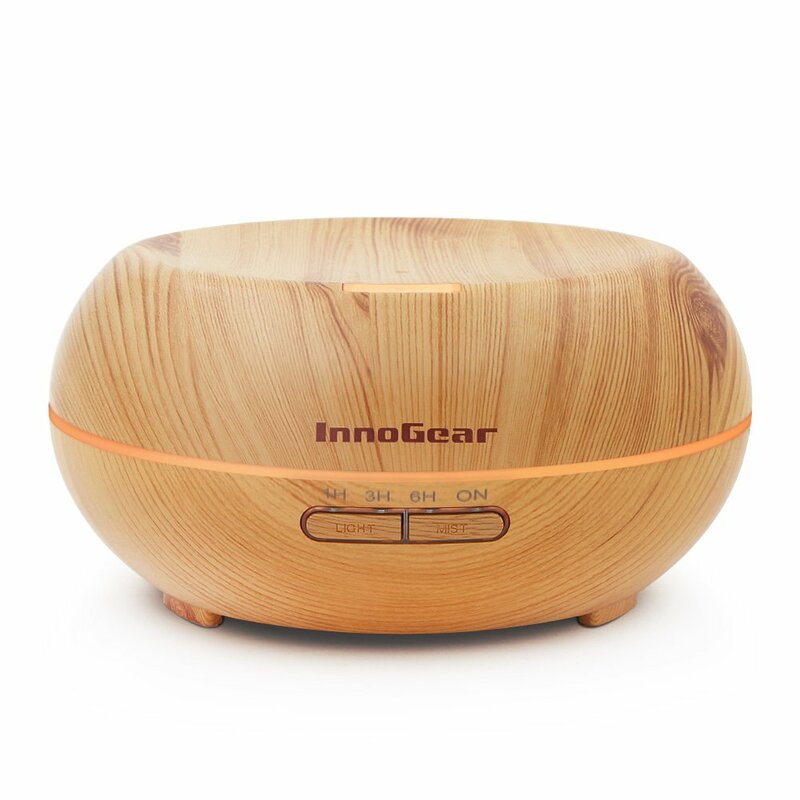 ​Built to be an unobtrusive addition to your room or your home at large, this ultrasonic diffuser has a light natural wood finish that’s very attractive. It runs with a maximum of 200ml of water and oils, so it’s a better choice for smaller spaces like your bedroom, the kitchen, or your office. ​You can set the diffuser to run continuously until the water’s finished, or you can tell it to automatically shut off after 1, 3, or 6 hours of steady use. To help it run longer, there are different levels of mist that are also adjustable. An LED light band gives off soothing light from around the device at night, unless you switch it off. Cycle between a few different colors or stick to one color. 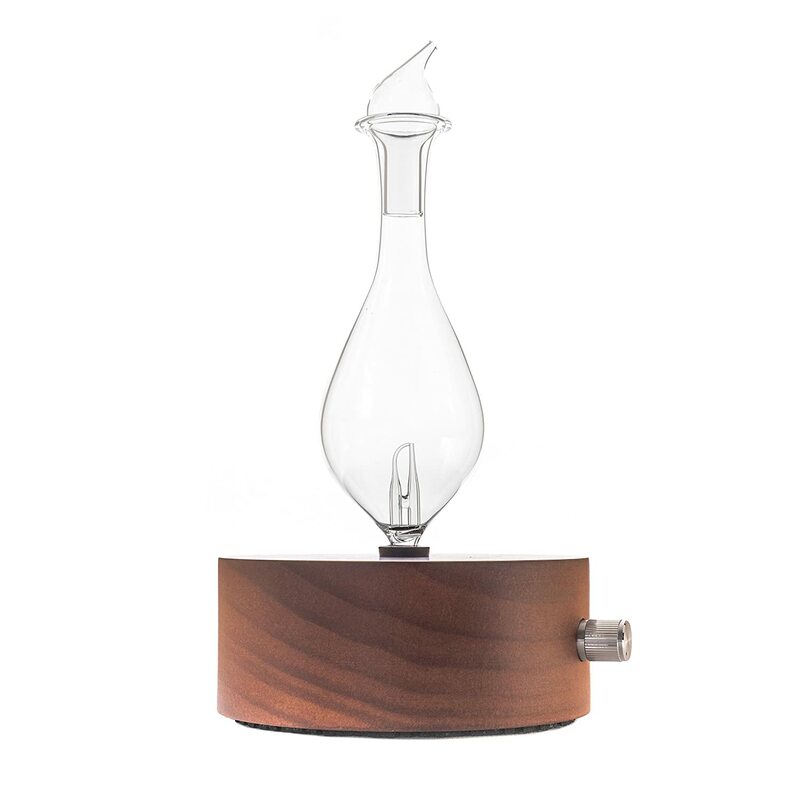 ​Built from high quality glass and wood, this is a device that’s made to last for a long time. Whereas plastic can corrode over time and use, the glass container won’t be affected by your oils, and will give you long-lasting results. The vapors diffused from this device will be more aromatic and beneficial for whatever type of oil you’re using. ​The intensity of the diffusion is easily adjustable to give you control over how much oil is used and how strong the scent will be in the room. Once you turn it on, the scent will be present in the room almost immediately, making this diffuser a good choice for those that want immediate benefits. Set the diffuser to run in timed intervals of 10 minutes diffusing, 30 minutes off. A shut-off feature will turn it off after 3 completed intervals of diffusion.